Here you will see District Notices, School Notices, and your portal Inbox with up-to-date communication. This area is currently not in use. This area displays phone and address information associated for your household. Changes to the household phone number can be requested from this area. This area lists household information for all family members along with their respective relationship status. Changes to phone numbers and email addresses can be requested from here. 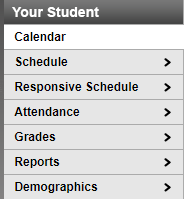 This area shows student assignment and attendance information. 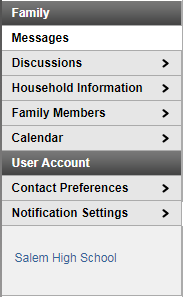 Parents can modify message contact preferences right from the portal. This includes providing/updating email addresses and the types of messages you want to receive. The default is Emergency, General Notification, and Teacher communications. You can select categories of notifications you'd like to receive. These include assignment scores (various percentage levels), attendance, and grade changes (various percentage levels). Provides a term view of your student's schedule. Includes links to view current assignments and email the student's teacher. This area is not in use at this time. This area provides a real-time view of attendance events for your student. This area provides an overview of grades by course/class. Includes links to view current assignments and email the student's teacher. This is where you can print out your student's schedule as well as report cards. This displays any Non-Household contacts associated with your selected student. Updates/changes can be requested from this area.